Product prices and availability are accurate as of 2019-04-17 04:16:17 UTC and are subject to change. Any price and availability information displayed on http://www.amazon.com/ at the time of purchase will apply to the purchase of this product. 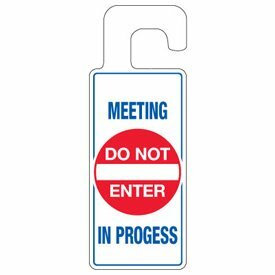 Use door hangers to inform employees of ongoing meetings and conferences. 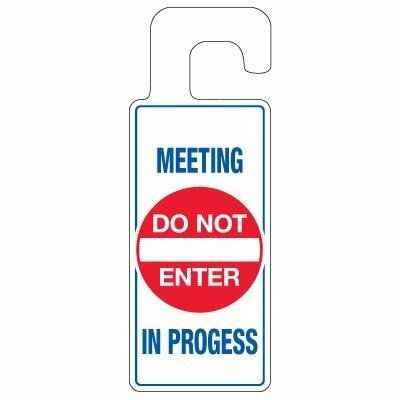 Available in calendered vinyl material Hangers measure 8-1/4"h x 3-1/4"w and are available with different stock wordings. Wording reads "MEETING IN PROGRESS DO NOT ENTER". Sold 10 tags per pack. Size: 3.25 by 8.25 IN Calendered Vinyl 3-1/4"